You might find songs for Funerals helpful. TiS 638 / NCH175 / CH717 / A&M518 / GtG793 / PH380 / UMH265 / LBW380 / ELW610 / PH380 / CP291 / CP(E) 346 / W&R638 / Cha503 / Lau430 / StF653 O Christ the healer we have come (Fred Pratt Green) Beautiful words and simple to sing. Good for intercessions. I like the tune INVERCARRY best, but it can also be sung to TALLIS' CANON if your congregation needs a more familiar tune. Lyrics and sound sample (of an alternative tune). New words to old tunes. Iona (Enemy of Apathy) / A&M779 / SP307 Sing my soul when hope is sleeping (John Bell and Graham Maule) "Sing, my soul, when hope is sleeping. Sing when faith gives way to fears; Sing to melt the ice of sadness Making way for joy through tears." This is more of a song for a soloist than for a congregation. Iona (HSNW) / VU019 / A&M839 / SP326 Kindle a flame to lighten the dark (Iona community) This song would also work well at various points in the service, including during intercessions. Good for kids Sound sample. ATAR606 / StS121 / FFS50 Nothing is lost on the breath of God (Colin Gibson) A beautiful song and very easy to sing even if new. "Nothing is lost on the breath of God, nothing is lost for ever; God's breath is love, and that love will remain, holding the world for ever. No feather too light, no hair too fine, no flower too brief in its glory; no drop in the ocean, no dust in the air, but is counted and told in God's story." Words and full sheet music. Sound sample. *Seeds of Faith Do you know that I am your friend? / I’m Gonna Stick With You (Richard Bruxvoort-Colligan) An excellent and fun song about friendship for kids. Lyrics, sound sample. Good for kids. *Recorded Music Out of the depths (Sinéad O'Connor) A sensitive and heart-felt version of this Psalm. From the album Theology. Youtube video. Lyrics. *Iona (Sent By the Lord) / MV066 Senzenina? / What have we done? (South African) This beautiful chant from South Africa asks the question that we often ask when things go wrong beyond belief. It's important to know what the song means when singing it. If you have some part-singers in your congregation, this would be particular good. It's good to let people ask this question. It is also on the soundtrack for "The Power of One" so you could also play the recorded music if appropriate. Free sheet music (loads a pdf). TiS 683 / WoV735 / ELW603 / W&R416 / StF649 God when human bonds are broken (Fred Kaan) These words pick up an unusual theme, and fit really well with this reading. There are a couple of possible tunes, none of which are immediately familiar, but they are not difficult either. Lyrics. *SFFS 2136 / NCH554 / GA227 / VU611 / G(II)636 / GC877 / Cha510 Out of the Depths O God we call to you (Ruth Duck) A simple and honest hymn, which sings this Psalm from the perspective of a community trying to work out its faith together. Excellent words and the tune is quite straightforward. Lyrics and sheet music sample. Video with lyrics (click on "more info" near the Subscribe button for the lyrics). *Taizé / CH276 / VU22 / GtG090 / ELW262 / GA283 / A&M053 / G(II)256 / GC332 / GC(II)340 / G(3)406 / CP094 / W&R166 / PfAS037B / SP28 / URW396 / Lau088 Wait for the Lord (Jacques Berthier) Wait for the Lord whose day is near, wait for the lord, keep watch, take heart. A lovely simple Taize chant. Sheet music, translations and sound samples. *AoVK-58 We wait in hope for the Lord (Nethaniel Ford) Simple a cappella round "We wait in hope for the Lord, God is our help and our shield. And so our hearts rejoice, for we trust in God's holy name". Good for kids. PfAS103B Out of the depths (Kathleen Harmon) A nice refrain. "Out of the depths I cry to you O Lord". G(3)143 With the Lord there is Mercy (Michael Guimont) A simple refrain to a cantor- or reader-lead reading. *Online resource Out of the Depths (Bruce Harding) A simple four part arrangement which would be nice if you have a choir or quartet that could sing this. Available for purchase, and you can view a sample PDF here. Note that the sound sample is for a different song, so that's a bit confusing, really. NCH472 / UMH474 / VU670 / R297 / ELW875 / HPP434 / GtG834 / PH404 / G(II)637 / GC874 / GC(II)847 / G(3)955 / CP509 / W&R500 / Cha628 / LUYH465 Precious Lord take my hand (Thomas Dorsey) A classic gospel song. Oldy-but-a-goody. TiS 667 / G(II)415 / GC591 How shall I sing to God (Brian Wren) The words are excellent, but neither the tune in TiS or Gather hymnals is straightforward because of the difficult meter; this might be a good song for your musicians to present to start teaching the congregation so they can remember it in more difficult times. 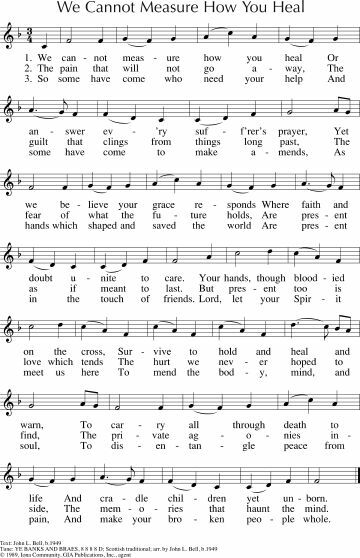 All lyrics and sheet music sample of the Gather hymnal melody (HOPE) here. *?PfAS130G For you my God I wait (Adam Tice) A good reflective song, needs to be played quite slowly and meditatively I think. Online Resource Out of the depths (Thomas Keesecker) Although arranged for choir, this song is simple and repetitive enough to be used as a meditative song for congregational worship. Sound sample, PDF sample, and purchasing options. The next 3 are all variations of the same Gelineau (cantored) Psalm, but with different responses. They are all pretty good, so I'm listing them all! There is just one change needed to make the Psalm inclusive (just change "his word" to "God's word" and it will be fine). GA077 / GC128 Out of the depths / I place all my trust in you O God (Gelineau) The original response from Gelineau. Very simple. Words to the response are "I place all my trust in you O God, all my hope is in your saving word". Sound sample and sheet music here (search for "I place all my trust"). Note this one also has a (non-inclusve) Trinitarian formula at the end. G(II)113 / GC127 / GC(II)71 / G(3)87 Out of the Depths / With the Lord There Is Mercy (Gelineau / Haugen) This response is also quite simple, but a slightly different emphasis. "With the Lord there is mercy and fullness of redemption". Not all versions are inclusive Sound sample and sheet music. TiS 81 Out of the depths / With the Lord there is Mercy (Gelineau / Carroll) Simple response is "With the Lord there is mercy and fullness of redemption". We have used this once at Brunswick Uniting and it went quite well. God doesn't like death, apparently. *MV027 Creator God you gave us life (Judith Snowdon) A lovely song, with a stirring chorus. I think it would be quite straightforward to sing: "Through hands that paint majestic skies, and voices chanting melody, with words that reach beyond the page, we comprehend your mystery. Lyrics (loads a pdf). TiS 617 / NCH413 / UMH517 / WoV736 / ELW626 / A&M605 / GtG818 / PH342 / W&R75 / 82Hml-695 / Lau428 By gracious powers so wonderfully sheltered (Dietrich Bonhoeffer / Fred Pratt Green) Wonderful words by Bonhoeffer. Lousy tune. Words fit well to O Perfect Love if you find the tune too tricky. Can also be sung to BERLIN or INTERCESSOR. The 5th verse is omitted in some hymnals. Lyrics. New words to old tunes. SiS414 / ATA 153 / GtG059 / Srce686 / PfAS105B / StF066 / LUYH347 / MP666 The steadfast love of the Lord never ceases (Robert Davidson) Can be a mushy favourite, and the language is not inclusive in older versions; PfAS uses “God’s mercy never comes to an end”. 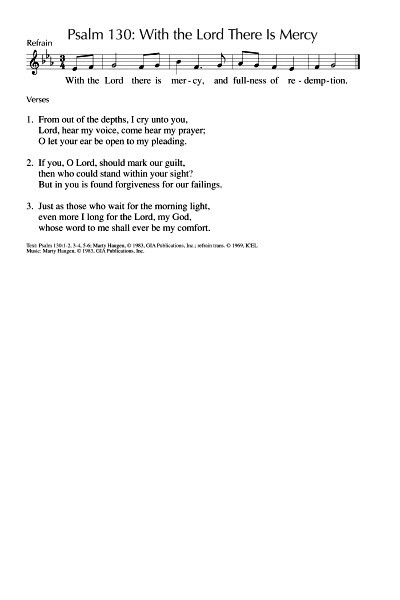 PfAS uses it as a sung response to a Psalm. Older style lyrics & chords. TiS 156 / AHB 91 / AoV1-135 / ATA 123 / CH212 / UMH145 / VU409 / ELW556 / GA537 / A&M545 / HPP267 / GtG664 / PH469 / G(II)546 / GC756 / GC(II)748 / G(3)855 / CP003 / W&R35 / Cha053 / URW186 / 82Hml-008 / StF136 / Lau671 / MP467 Morning has broken (Eleanor Farjeon) This song makes me smile every time. Here's Yusuf Islam (when he was Cat Stevens) in 1976 (love those green boots). Oldy-but-a-goody. *CP517 / W&R503 O God your constant care and love (Glen Lanier) Quite good words about God's presence with us through our lives. Sung to a standard hymn tune. Lyrics and sheet music. God heals. Turns mourning into dancing. Anger is but for a moment; Weeping may linger, but joy comes in the morning. NCH433 / CH727 / UMH707 / VU703 / HPP474 / GtG250 / W&R515 / Cha638 In the bulb there is a flower (Natalie Sleeth) A simple song of hope symbolised in nature. Particularly good for those churches in colder Northern Hemisphere who have a while to go before Spring. Lyrics. URW255 You have turned our sadness into a joyful song (Elise Eslinger) A simple and joyful refrain with a read Psalm. TiS 647 / AoV2-012 / ATN 25 Comfort, comfort all my people (Robin Mann) Easy to sing, beautiful lyrics. Chorus is “Comfort, comfort all my people, with the comfort of my word. Speak ye tender to my people, all your sins are taken away”. Lyrics, mp3 sample. *PfAS030D Though weeping and deepest sorrow (Simei Monteiro) The chorus is super-cool, with a driving rhythm (and a part for a triangle!). The verses will be best sung by a soloist, I think. ATE 253 He turned my mourning into dancing (Unknown) This is not at all inclusive, but if you change the lyrics to make it addressed to God “You turned my morning into dancing”, it’s much much better. Tune In: You in all our worries / All will finish well (Dave Brown) “In this world where injustice reigns, you are in the midst of pain”. Excellent words of reassurance in a difficult world. Sound sample and downloadable songbook. *NCH085 / SFFS 2082 / Cha623 / ZSS105 Woke Up This Morning (African-American Spiritual) A great Spiritual. If you don't have one of these sources, you can just make it up from this video.... This could be a good Sunday to make use of those choir stalls; could even get the kids to write their own lyrics... Surreal version here. Good for kids. 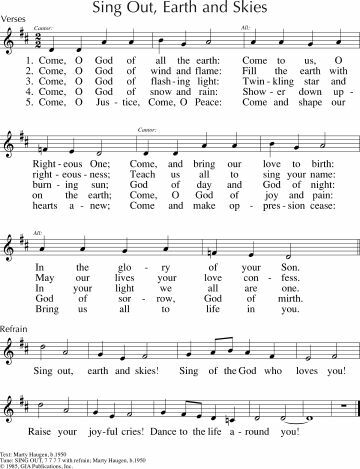 TiS 181 / AoV2-032 / GC(II)497 / G(3)577 / CP589 Come O God of all the earth / Sing Out Earth and Skies (Marty Haugen) A very joyful song for cantor and congregation, or small group and congregation; this is a big favourite in our church. Sheet music, lyrics and sound sample. CH683 / VU420 / A&M491 / GC(II)469 / G(3)546 / GtG295 / CP598 / W&R553 / SP156 / URW132 / Lau426 Go to the world Go into all the earth (Sylvia Dunstan) Great words of sending out. Can be sung to a couple of different tunes. SINE NOMINE is the easiest and best known. New words to old tunes Sound sample. Sheet music sample. VU166 / SFFS 2210 Joy Comes with the Dawn (Gordon Light) Lovely words. The verses are very straightforward; it might be helpful to teach the chorus because there's a couple of jumps. Lyric slide show! AoVK-125 / ATW 489 Turn our sadness upside down (Leigh Newton) Good for kids, and adults too. Simple tune, but not so simple that it’s boring. Lyrics (search in the page for "sadness"). Good for kids. PfAS030B I will praise you O Lord (John Bell) A lovely simple Psalm response - this one will work well sung as a response to the Psalm, or sung on its own where appropriate in the service. Works in Spanish too, and is Good for kids. Beneath the Noise You alone are my God (Nick Randall) A lovely simple song with two verses and chorus based on Psalm 62 and Psalm 30. Quiet and reflective. TiS 174 / UMH194 / A&M544 / CP(E)259 / 82Hml-585 / StF012 Morning glory starlit sky (William Vanstone) Quite formal words, but very very beautiful song of God's boundless love "Drained is love in making full, bound in setting others free, poor in making many rich, weak in giving power to be". Not all sources are inclusive. The tune is not difficult, but will need to be taught to a congregation if not familiar. The lyrics could also be read as a poem, and challenges the image of Christ as monarch, but also affirms God's reign. Lyrics. TiS 288 / Iona Not the powerful not the privileged (John Bell) Note that the lyrics are masculine for God in one instance in the 4th verse. The lyrics are great though, so perhaps balance this song with some feminine imagery elsewhere in the service! The tune is not difficult. Recorded music Someday soon our time will come (Dead Heart Bloom) I don't know if this really fits, but it seems to fit the Pauline ideas of being courageous in faith. See what you think - I think this could work very well played after the sermon, if you are the type of preacher who likes to end with questions rather than answers. Make sure you make the lyrics available to your congregation; I had to listen 2 or 3 times to hear them well. Lyrics. Tune In God's Mercy (Sheree Anderson) A beautiful ballad of healing: "Like the sun upon my skin, I can smile and take it in, and my wounds begin to heal, that's God's mercy". Sound sample and downloadable songbook. *Seeds of Faith Jesus’ hands are Healing Hands (Richard Bruxvoort-Colligan). A simple and fun kid’s song. "Jesus hands are healing hands, full of love and grace”. Lyrics, sound sample. Good for kids. *NCH274 / CH118 / SFFS 2046 / GTG003 / CP390 / Cha014 Womb of Life and source of being (Ruth Duck) Feminine trinitarian imagery. An easier tune, listed in some hymnals is IN BABILONE. Others have LADUE CHAPEL which is a little less intuitive. Lyrics and sheet music. New words to old tunes. *MV132 Great sorrow prodded Jairus (Elizabeth Stilborn) A simple storytelling song with honest, inspiring lyrics. TiS 737 / Iona (Common Ground, HSNW, T1AU) / A&M516 / SP142 / URW427 / Lau437 Lord Jesus Christ lover of all (John Bell) A beautiful and simple chant. Note that some versions (T1AU at least) have a beautiful 4 part harmony arrangement with excellent moving parts in the lower registers. Would work well during intercessions or during times of movement in the service. *MV149 / CoC35 Peace for our children (Doreen Lankshear-Smith) A simple and quite repetitive (in a nice way) song that prays for peace for children, women, men, families, nations… and the soul. Good for kids. TiS 692 Sometimes a healing word is comfort (Patrick Michaels) A good song about healing. The verses take a little getting used to and the chorus is very joyous and simple. Perhaps get your congregation to join in as they become confident - there are 5 verses to learn on. *Iona (Love From Below / common ground) / CH718 / VU613 / A&M522 / GtG797 / G(II)401 / GC575 / GC(II)558 / G(3)657 / CP292 / CP(E) 348 / W&R628 / SP140 / URW146 / Lau433 / StF655 We Cannot Measure How You Heal (John Bell) Really very excellent words to a very familiar Celtic air. Easy to sing; be careful not to get too fast; it's tempting but the words need a slower tune. Sheet music sample. Sound sample. *CH570 / UMH512 / W&R495 / Cha629 / ZSS164 When the storms of life are raging (stand by me) (Charles Tindley) A good gospel song. 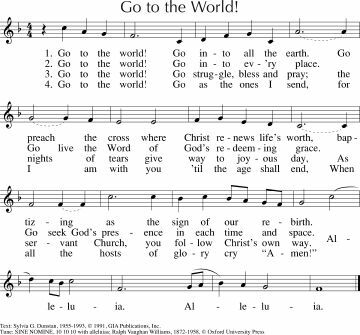 Hymnals have a range of translations. Sound sample and lyrics. Good for kids (unless you sing it like Elvis). GtG178 The woman hiding in the crowd (Dudley Weaver) Good words of Christ healing the bleeding woman who touched his cloak, that extend to our own burdens, aches and sins about which we dare not speak. The tune will need to be taught. CH350 / UMH263 / VU358 / StS044 When Jesus the healer passed through Galilee (Peter Smith) A simple song with many verses (you don't have to sing all of them! ), and a simple "Heal us, heal us today" refrain. This would be good for kids or those who can't read, as they'll be able to join in easily. Verse 5 is particularly appropriate "The death of his daughter caused Jairus to weep, Heal us, heal us today, The Lord took her hand and he raised her from sleep, Heal us, Lord Jesus". Good for kids. ATAR618 Just like Jesus (Robin Mann) A fun song for kids, pointing out the things Jesus did that were not really very acceptable! Verse 4 will need to either be explained or omitted - the song works just fine without it. Good for kids. Do you have ideas you would like to share? Please add them in a comment below so others can hear your ideas too. Natalie, thanks so much for this wonderful resource. I have often used the tune O Wally Wally on O Christ the Healer. Works really well and familiar to most people.